Let’s see what’s up with Patty…..
Patty was just dropped off at O’Hare airport after finishing a 3 day workshop on Lean Six Sigma statistics, design of experiments, and statistical process control. Interestingly, the students were lawyers. In recent years more and more service-based organizations were adopting lean six sigma and it was a long time since Patty had taught such a workshop to engineers. She noted that although the lawyer’s math skills were a bit rusty, they were very good listeners and picked up the math behind lean six sigma topics very quickly. After paying the cab driver, she entered the terminal and went to see an agent. She was early enough to get an early flight home, so she had called the people at the online ticket agency, during the cab ride. They said the change fee would be over $300, she felt that was just too much to pay. She was delighted to see that it was only $75 at the terminal. She looked at her paper boarding pass and saw that she had more than two hours, just enough time for a relaxed lunch at Wolfgang Puck while she read USA Today. Patty was the only person her age that she knew who enjoyed reading a paper newspaper, she guessed that she picked the habit up from her dad. The two hours went by quickly and she was standing in line waiting to board the flight to Boston’s Logan airport. She had now been at Ivy U for a few years and traveled much less than when she worked at ACME. She had forgotten how stressful and unpleasant traveling was. As she stood in line, the man in front of her put his smartphone on the scanner and the scanner could not read the QC code. He and the agent fumbled for a while before they got it to work. This was another place where paper was still king in her opinion. Patty got on board and settled into her middle row seat. She groaned a little bit at how uncomfortable and cramped it was. Patty was reminded of what her dad used to say in situations like this; “I know it is a bit uncomfortable, but just think what the ‘49ers went through to get to California,” he would tease. After take-off, she turned her laptop on. She absolutely had to send some emails, so she signed on to the onboard WiFi. She got sticker shock when she saw that it cost $18.95! Even though Ivy U would pay for it, the high price galled her a bit. After she finished the emails, a wave of fatigue swept over her and she needed a break. She chuckled to herself when she thought of a recent event. She had taken two of her best teaching assistants (TAs) to lunch and the conversation somehow came to discussing people who hid Jews from the Nazi’s in World War II. 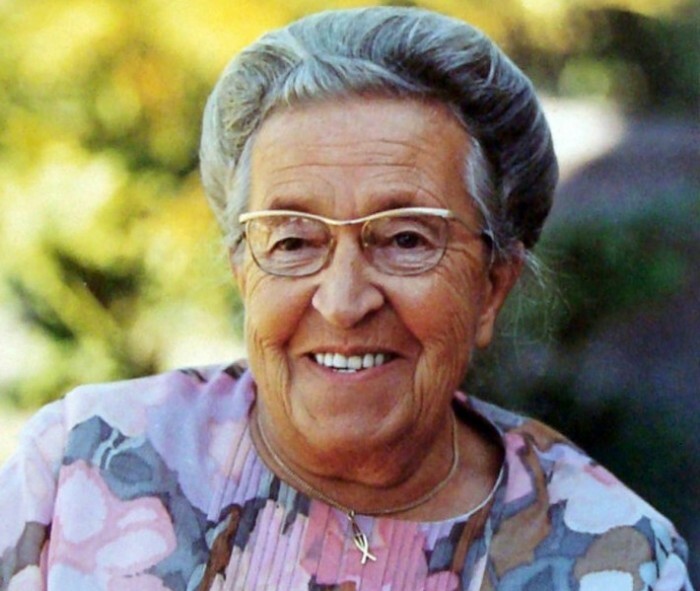 Patty mentioned to her two young protégés about an excellent book and movie she read and saw as a teenager, “The Hiding Place.” The story is about Corrie Ten Boom and her family and how they hid, and hence saved, many Jews from the Nazis in Holland during WWII. Although the movie was made before she was born, it was shown at Patty’s church every few years, for the new sets of youngsters who came along. Patty mentioned to her two superstar TAs that the film was produced by Billy Graham’s organization. “Who is Billy Graham?” they both asked in unison. Patty struggled to keep her composure as she explained who he was. How could they not know this? She decided to examine the situation a bit further. “OK, you two. Who was Mickey Mantle?” Patty asked. The youngster’s both looked at each other. “We have no clue,” they chuckled. Patty started humming a few bars of Orbison’s most popular song. “Oh, Pretty Woman,” the boys said in unison. The next day Patty arrived at her office early to meet with Rob and Pete to discuss how the presentations that they were making for Mike Madigan on voiding were coming. Patty had arrived so late the night before, that Rob was already asleep. She did not see him in the morning as it was her turn to get the boys ready for school and he was off early to get in his 90 minutes of exercising. So, they had no chance to discuss the progress of the presentation. “Pete, your presentation of BGA voiding is terrific. How is my hubby doing on BTC voiding?” she chuckled as she looked at Rob. “I feel like I’m going to get yelled at 'cause I didn’t do my homework,” Rob said sheepishly. “Yikes! We only have a few days,” Patty responded, “And I have yet to do my part on using solder preforms to minimize voiding,” she went on. “I’m only teasing. I have quite a bit of info,” Rob said. “We have been out of the mainstream for a while and one thing is for sure, voiding is the number one issue among assemblers today. So many people are assembling QFNs and are struggling with voiding. Voiding with some solder pastes can be over 50% of the area,” Rob went on. “Wow! With 50% voids, think of how poorly the heat is being transfer away for the BTCs,” she looked at Rob and chuckled. “Remember, ‘BTC’ not ‘QFN,’ Patty went on. “Yes ma'am,” Rob jokingly replied. “Can you imagine the effect on reliability and field issues with so little heat being removed? The ICs inside the BTCs must be frying” Pete added. “Voiding at this level has got to be really costly,” Patty mused. 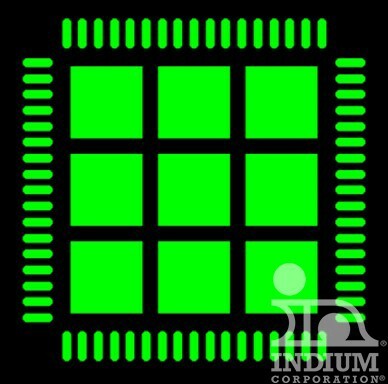 “One of the things that really helped me was that I found out that Chris Nash of Indium Corporation is studying the topic and has done quite a few experiments on voiding. He gave me quite a bit of helpful information on the topic” Rob added. “What were some of the key points?” Pete asked. “Well, as you might expect, the solder paste is typically the most critical part of the process. Some pastes have voiding lower than 10% with others above 50%,” Rob replied. “What about the process?” Patty asked. “Well, the reflow profile can be very important, as is controlling the PWBs and components. But, with the best pastes, Chris found that you can control the voiding content even if you can’t change the reflow profile and the PWBs and components have some issues,” Rob responded. “Look at the x-rays of poor and good voiding between two pastes,” Rob said. See figure 2. Figure 2. 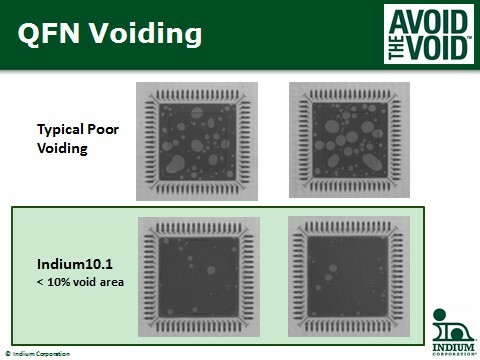 A solder paste that is designed to minimize voiding is the best place to start in an effort to reduce BTC voiding. “What a difference,” Patty and Pete said in unison. “What about the stencil design and venting?” Pete asked. “Chris said that stencil design for venting is not as critical as once thought, although a window pane (see figure 3) design is usually used,” Rob replied. Figure 3. Many people use the window pane design for the stencil to allow for venting. “So it sounds like starting with the best solder paste solves 90% of the problem and adjusting the process, say with the right reflow profile, helps refine the result,” Patty summed up. With this Rob went off to put the finishing touches on his PowerPoint® slides for his part of the presentation, while Patty started working on her part of the presentation on using solder preforms to reduce voiding. Patty’s mom and dad came for a visit on a Sunday. Her mom had graciously offered to bring a complete Sunday dinner. Patty, Rob and the boys were grateful for the delicious meal. As they began to eat, Patty shared the story of her best students not knowing who Billy Graham et al were. “But, what was even more surprising was that I ended up asking ten or twenty more students and only one had ever heard of any of these four ‘famous’ people,” Patty sighed. “It’s your age,” Patty’s mom replied. Thirty years old was not that far in the rear view mirror for Patty and she really didn’t consider herself old. “These youngsters were born in the late 1990s, a generation after these people were prominent,” her mom went on. “Mom’s right. Do you know Billy Sunday, Ty Cobb, Glenn Miller, and Trotsky?” her dad asked. “Who?” Patty asked. And then she chuckled, getting the point. As always, this story is based on true events.